A dope 12 inch by the professor Harshkovitz featuring MF Doom. This was the first release off of the prof's LP Convexed. 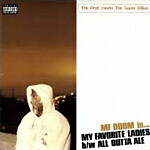 Doom ruins these beats and any fan or collector who missed it back then will want to pick it up this time!!! The 2015 repress is on black vinyl.